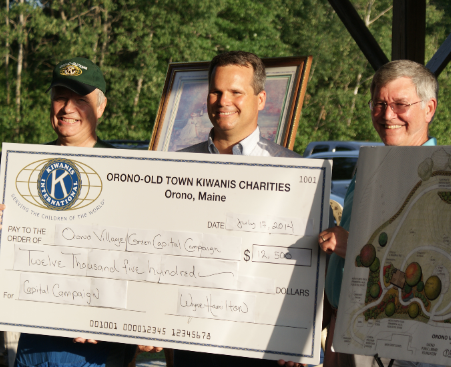 Kiwanis gives Orono Village Green major boost! 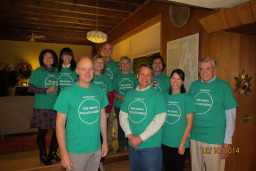 The Orono Public Library Foundation announced a major boost for Chapter Two: The Campaign for the Orono Village Green. At their annual auction, the Orono-Old Town Kiwanis Club presented a check... for $12,500 for the Orono Village Green to Campaign Co-Chair Brian Rahill. The campaign has raised $201,777 through the generous contributions of 109 donors including individuals, families, foundations, businesses, and organizations. During the public phase the Foundation would like to complete the campaign goal by the end of 2014 and transfer the funds to the town. The Foundation has secured an additional $36,000 for the $370,000 capital campaign goal since publicly launching the project on May 30th. “As donors to the Orono Public Library building campaign, the Orono-Old Town Kiwanis Club views our support of this new campaign for the Orono Village Green as a demonstration of our commitment to our community,” President Robert Swindlehurst said. The Foundation is grateful for the generous support of the Orono-Old Town Kiwanis Club!